How did we get to the second last month of the year so quickly! Clearly there is truth in time passing quicker the older you get. Are the most magnificent mini roses from our garden. I bought 2 new rose bushes seeing as I killed our best rose bush when I transplanted it a couple of months ago. My sadness of losing the other bush is quickly forgotten with these beautifully coloured roses. Is millet. For the life of me, I cannot remember who’s blog I saw millet on so my apologies for no link love. I will post a millet and grape salad recipe next week. 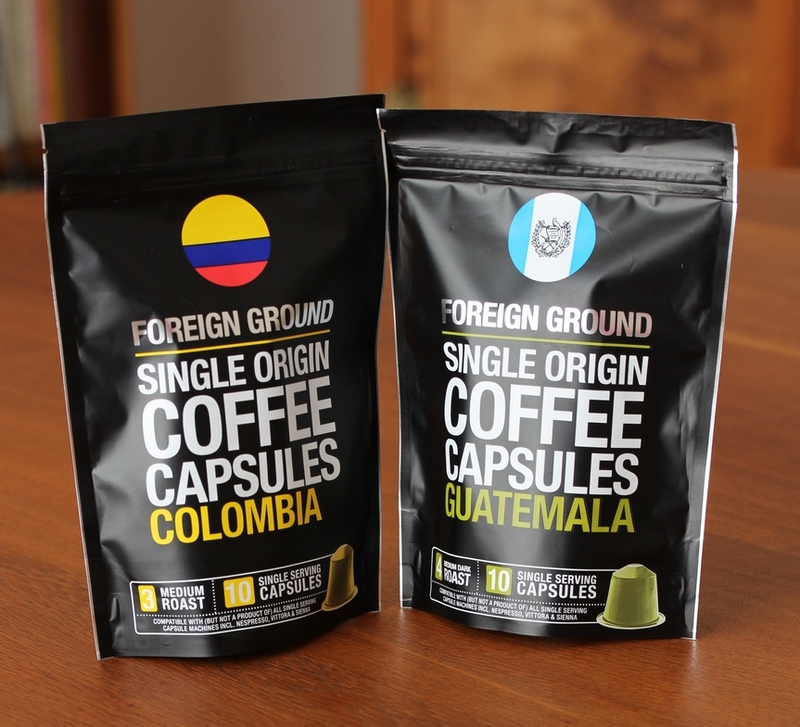 I found 2 new varieties of Pete’s coffee pods, up to now I have only been able to find the Foreign Ground Brazil Single Origin. Is our new 56 litre LG Mirror Microwave. Sorry it is not a picture of ours but I ran out of time so quickly got this one from the brochure. I am not entirely convinced this new modern “metallic” look works for me as each item (fridge, dishwasher, washing machine etc) is a different shade of “silver” even within one brand so its’ awfully difficult to match items. Bring back classic white which doesn’t date and matches everything. I have two complaints about this new edition to our kitchen. 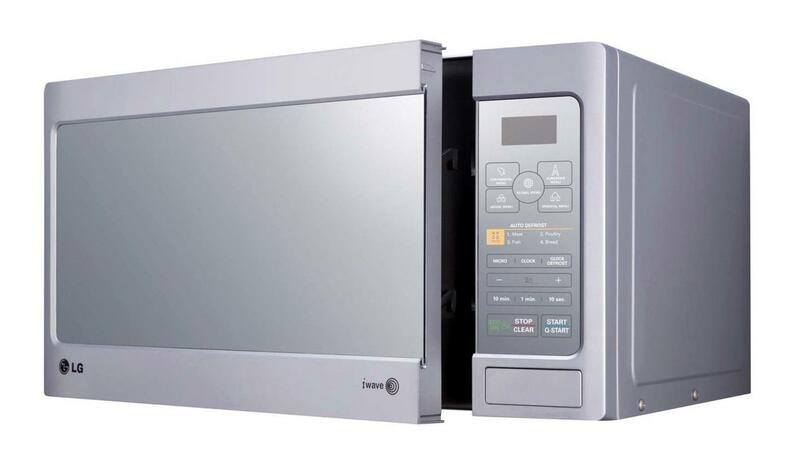 Even though I only use it to reheat and make the odd gravy, I still want to be able to see inside the unit when it is on – some genius thought about the aesthetics (not sure why you need a mirror on a microwave – possibly do your hair while heating lunch?) and not the functionality so you are left guessing when something is going to boil over! It doesn’t have a kitchen timer either which was so handy on our old microwave. My suggestion to you would be not to buy a mirror unit, unless you want to sit in front of it to do your hair or make-up. I have also had many unsuccessful calls to LG, their service is shocking – they are useless! Right rant over. Are “Nigerian” from Lebanon ice cream powders. Pete, like me, loves finding something different on the shelves in supermarkets and he came across these. Albeit they are instant – mix powder with milk, he says they are really very nice. I will report back on what I think. Is the smallest tin of condensed milk I have seen – 78g. Pete knows how I love small, what I call “nunu” things so when he found this he couldn’t resist buying it for me. This entry was posted in Daily Blog and tagged Coffee pods, Condensed Milk, Garden roses, Ice Cream, Ice cream powder, In my kitchen, LG microwave oven, Mandy Frielinghaus, Microwave, Microwave oven, Millet, Mirror microwave oven, Roses, The Complete Book by thecompletebook. Bookmark the permalink. That ice cream looks right up my alley! My mom and I love finding new things in the grocery store! Oh Mandy, your roses are so beautiful… lots of other goodies too, but those roses, wow! I haven’t had millet in ages! Must buy some this week to make a salad too. Have you tried the Mugg & Bean capsules? They are very good, we particularly like the Mocca Java but the House Blend is also good. Pick n Pay R52.99, Checkers R49.99 per pack of 10. Can you believe I don’t remember ever trying millet? Such pretty flowers. I can’t imagine what the ice cream tastes like, it’s like something that they would take up into space! Curious to hear your take on it. My ovens are nearly like mirrors too, my little girls are forever staring at themselves in them! Thank you for the peek into your kitchen this month so interesting as usual. I love mini things… except for cake! Your little tin of condensed milk is super cute and a really handy size for when you want to add some to your iced coffee without having the evidence of a half empty can in the fridge. 🙂 I made some millet porridge recently with pistachios and cocoa nibs. It was a nice change from oat porridge. I’d love to know how your ice cram turns out. I love snooping in your kitchen! The ice-cream powder is Interesting. It works? 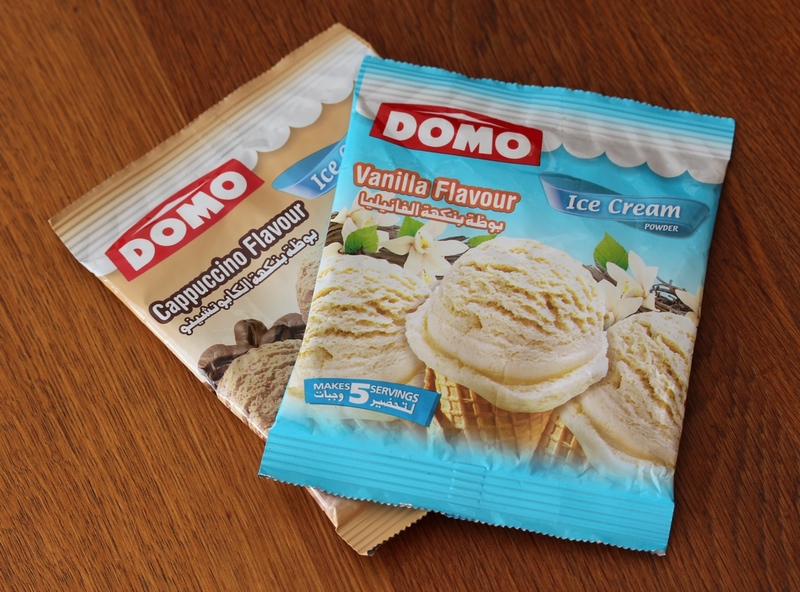 Haven’t tried the ice cream powder yet – Pete says it works really well so will have to test it soon. Gorgeous roses. I too love to look for new items in the food markets to try. I think the microwave was designed by someone who is not a cook, who sits in the ivory tower and come up with “cute” ideas. Hi Mandy , That ice cream powder is interesting. When we were in Lebanon we were amazed that we couldn’t find any milk, only powdered milk. Maybe that is how they make their ice cream. Gorgeous roses Mandy, can’t wait till you post the millet and grape recipe! What an amazing rose variety! Truly glamorous and elegant. All of the other ‘finds’ here tell me there are a vast quantity of fabulous food adventures ahead. As always! Have a beautiful week, my dearest! There is some lovely South African tea in my kitchen that I am enjoying very much! 🙂 Thank you again Mandy. As for your kitchen, I absolutely love those roses!!!! What a joy to have those in your own yard! 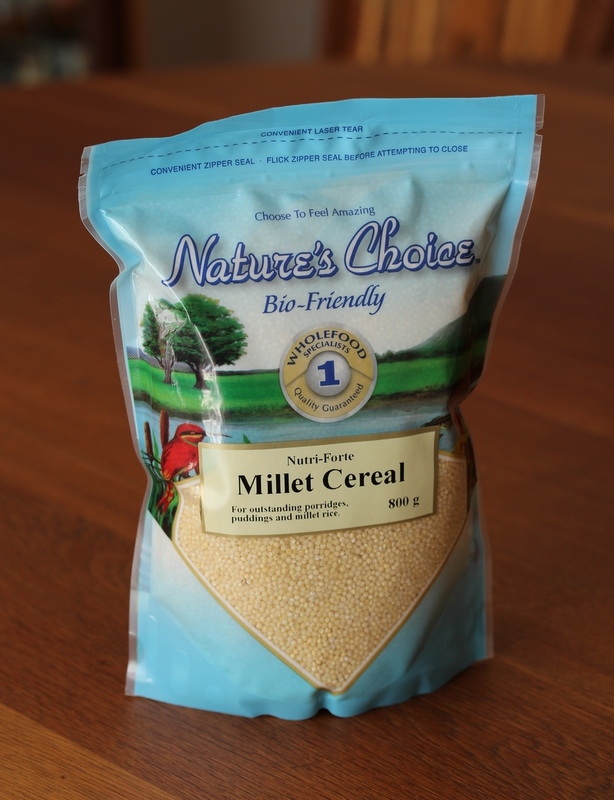 Millet seems to be the new quinoa. Must try it as it is a much cheaper product. Lovely roses. G’day! You had me at the flowers and always enjoy finding and learning about new things too! Mandy, not being to “see” into the microwave would be frustrating indeed, but I liked your humorous alternative. 😉 Your roses are absolutely beautiful… gorgeous photo of them! I haven’t tried millet — looking forward to seeing what you do with it. The roses are absolutely gorgeous! Ice cream powder sounds quite interesting. I too recently bought millet and so far have only put it in multi grain breads. There’s nothing as elegant as a vase of roses and those are absolutely beautiful. I’ve been lucky with the few rosé bushes I have in that they keep producing flowers even though they get some kind of blight on their leaves. I can only imagine what it would be like having a mirrored microwave…I think I’d jump every time I walked by thinking there was someone else in the kitchen with me! I guess I like the idea of seeing how the food is doing and seeing as I’m so forgetful, I think I might forget I had food in there. I haven’t ever tried millet so I’ll be waiting to hear how that goes. Of course I’ve never heard of the ice cream powder either…see all of the things I learn from you? I think i might be responsible for millet mania! We have it at least once a week, usually as a pilau. Nancy’s suggestion that you toast the grains in the pan before you add stock is spot on. It not only enhances the flavour, but also helps keep the grains from clinging together when it’s cooked. I’ve never seen condensed milk that small, “snack” sized! beautiful roses. 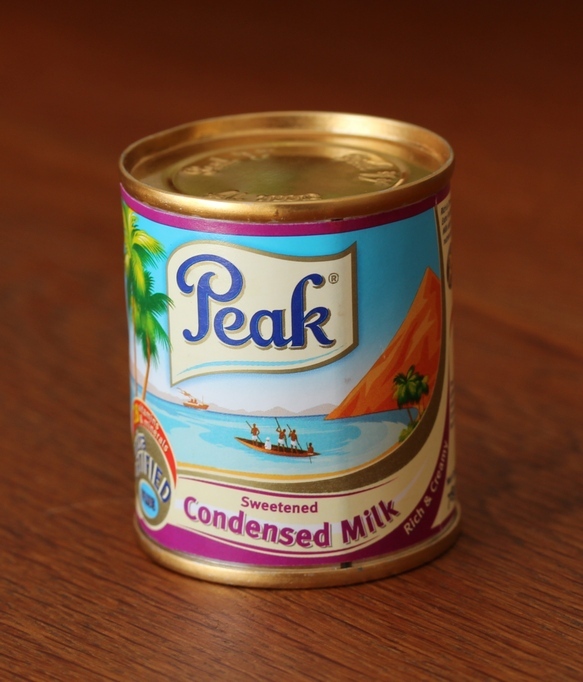 and what a cute little tin of condensed milk. and that microwave.! i am always complaining about designers who design (or not) kitchen appliances etc. do they not test them first? we have a dishwasher which washes just fine but the shelves are just hopeless. nowhere to put glasses properly, and the slots for plates and so on are this weird rounded shape that fits nothing! i can’t believe they don’t try stuff out! grrrr! Hi Mandy, the roses are beautiful! Will be interested to hear your report on the icecream and seeing your millet salad. Hi Jason, thanks for stopping by. I am beyond thrilled with the roses. Can’t believe I haven’t made the ice cream yet – soon! Wow, very surprised to hear that about the microwave!!! Those roses are stunning and everything looks very interesting in your kitchen this month! Be sure to get back to use about that ice-cream powder I’d love to know how it turns out!